make it perfect: .New pattern...AFTERGLOW. Afterglow is a super sweet nightdress designed for little sleeping beauties...you know, the little girls that just have to wear a dress everywhere?!! This simple design, featuring pleated front detail and dainty puffy sleeves, is comfortable and easy-to-wear for a good night's rest. Due to it's classic look, Afterglow can easily double as a play dress with side ties - yep, good enough to wear day or night, dancing in the backyard or twirling in the bedroom! It seems that most of the patterns I design come because of some little obsession or need for a certain article of clothing...Sprout was designed because Lil needed a warm dress...Sweet Dreams, because I wanted a decent pair of jammies...Afterglow was designed after Lil suddenly became obsessed with dresses and demanded to wear her play dresses ALL the time. She doesn't really wear pyjamas at the moment, just picks a dress from her cupboard (or the ironing basket!) and wears it to bed and we have one happy little girl! 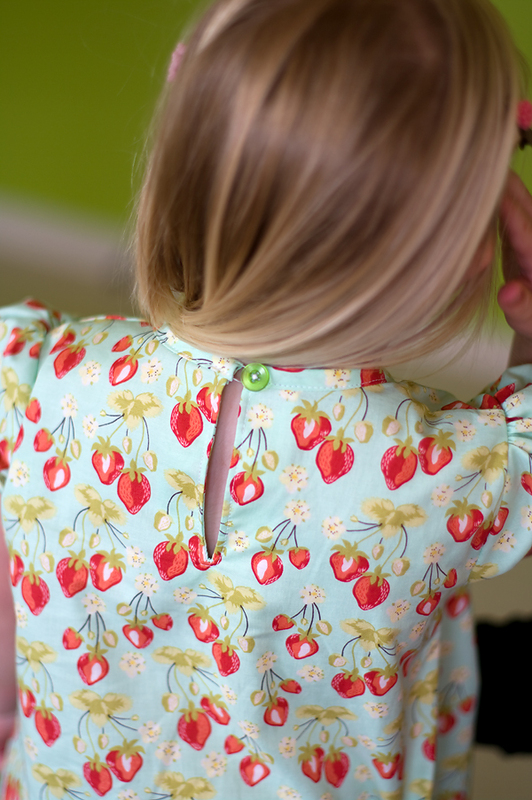 So what better thing to do than make a nightdress which looks good enough to be worn as a play dress too? She can wear it day and night as she pleases! I love this pattern because it is so fast to sew up, definitely can be achieved in one night, yet the finished dress doesn't lack sophistication and attention to detail. Once again, Fiona has outdone herself with these adorable photos - thank Fiona! Click here to see more Afterglow pictures and check out the fabric requirements. If you have a store and want to stock this or any other Make It Perfect patterns, contact Creative Abundance to place an order. If you would like to purchase a copy of Afterglow for yourself, they should be popping up in retail stores very soon. Ask your favourite store to get one in for you! See you tomorrow with my favourite pattern out of the three!!!! What a sweet nightgown! My little girl pretty much demands to a dress to bed. Love the pattern! Oh, what a great idea for a Christmas gift. I know lots of little girls that would love something like this. 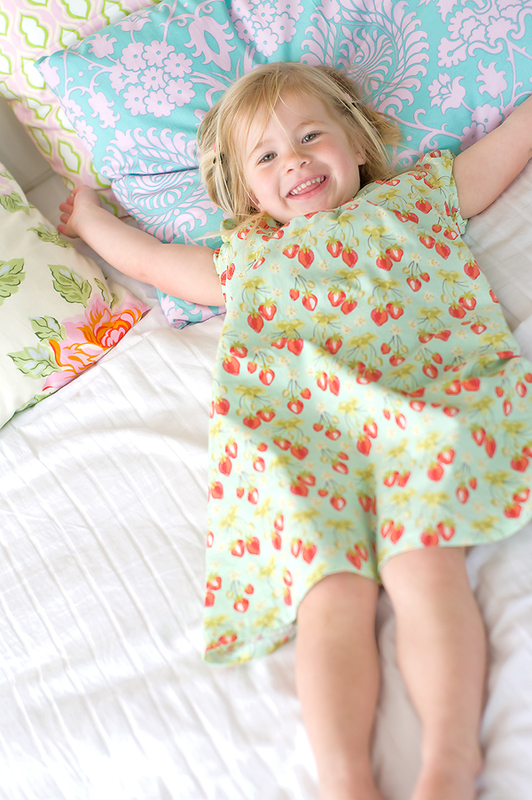 What a sweet little playdress/nightie! I have 3 little granddaughters who would each get one of those! Lovely! So sweet! Your "pillows" look fabulous in the background. Looks like a fun photo shoot. It's adorable! And so is the model! I don't have daughters, but I think if I did, I might let her wear that as a "regular" dress, too--it's just so perfect and classic looking. It'd be so cozy in flannel, too! Adorable! Love those pictures of your girl! Great idea! would love this one! Great pattern. I'm going to steal your idea from the hooded dress pattern (sorry forgotten the name at this exact moment) and do it in flannelette for these seriously cold nights here in wintry Montreal. That is too cute to be a nightie! Super cute! I love that it works as a dress for daytime too. O.K. I would definetely have a go at this one Toni. I like that it can be both day and night. 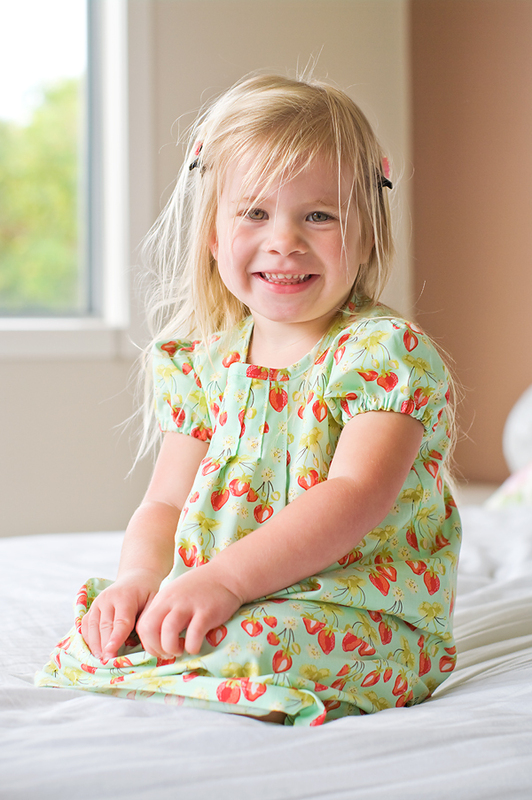 Beautiful dress pattern and I love the strawberry fabric you used for it! :-) Cute, cute, cute!!! And a real cutie modeling too! Another gorgeous little pattern Toni, well done! Oh, I have a little niece this cute dress would be perfect on! Pick me! Lil looks wonderful in these photos :) So sweet! Ohhh so sweet. My little one is too small to demand dresses for bed so I would definatly sew this up for dresses. Very classic. Love this one, love the little sleeves, the pleated front and the sweet sweet pictures you have! It would be perfect for my little girl. This is way to gorgeous to wear to bed !!! I can see my daughter wearing it all day and night ! Congrats on another great idea and pattern ! would love to make this for my daughter!!! thanks! No longer do I need to ponder with what to do with some handed down fabric that my mother inlaw had kept. Im not big on matching mother/daughter outfits but this would be great for using left over fabric. After Glow is just a gorgeous design. It would be perfect for my 2 y.o. granddaughter. Please enter me in your competition!! Lil just looks beautiful, as usual. Oh I LOVE, LOVE, LOVE this pattern!! It is so sweet! What a cute and practial dress/nightie! My girls are going to be beside themselves! I have so much fabric in my stash waiting for the "perfect" summer outfit- think I've found it! WOW I love this pattern, I have the perfect flannel to make one for winter as well :o) Your 3 patterns are just gorgeous. Well done. Absolutely gorgeous, I know two little girls who would just love that! What a cute nightie, my girls would love that for day or night. Every little girl needs a couple of dresses like this in her wardrobe. This is my favourite Toni! and... what a beautful model! I don't think this could be any sweeter! With two Granddaughter, I would be honored to win. How adorable! Love love it! thanks for the chance to win such a great pattern! my daughter (and all of her friends) would LOVE this! So cute -- wish I had one when *I* was a little girl! Love it. A very cute dress with sleeves. Keeps those little shoulders warm in bed. 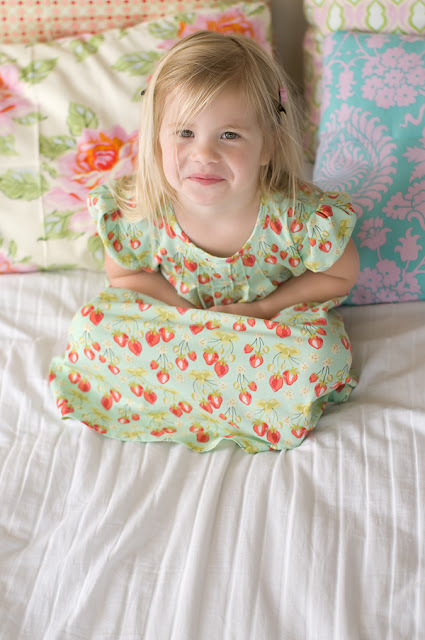 I really need my own little girl so I can have an excuse to sew this dress... Lucky I have nieces! This pattern is adoreable.... I can think of a couple of girls who would love to wear this day and/or night!! That is a darling nightgown. I'd love to make my granddaughters each a nightgown. This is a gorgeous nightgown! I would love to make it for my little princess! Very sweet- love the pintucks!